So you know about that bug in the Krisflyer site that was preventing me from redeeming my miles for a vacation in Singapore? I doubt if they’ve got it fixed yet, but after several complaints I made via email, a nice lady from Krisflyer finally called me 2 days ago. She informed me that she would be so kind as to help me book my flights for redemption over the phone itself, since they had no inkling on when they would be able to resolve the problem. In addition, she would also honor the 15% discount on miles redemption I would have otherwise been entitled to had I booked the flights online. Yippee! The flight confirmations were done in a jiffy and I received the itinerary by email within an hour or so. The ticket redemption was only for my hubby and me, and even though Ethan would be travelling with us, I decided to get him a ticket. Since he is below 2 years of age, his ticket will only cost 10% of the full fare plus the relevant taxes (originally I had thought it would be free for Ethan but aiya, apparently SIA says there is no such thing for them). I called up the Singapore Airlines ticketing office in Penang yesterday and made Ethan’s booking. So everything is confirmed, and the only thing left to do is to issue the tickets, which I will do so in due course. After all, we’ll only be travelling in a couple of months’ time….and I really can’t wait. Singapore, here we come! And yes, if you are wondering, I purposely adjusted our vacation to coincide with the Great Singapore Sale! Woohoo! 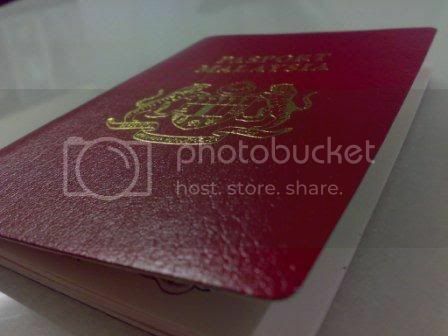 I seriously love that photo of your passport! That is so artistic! Love Love Love! The Giddy Tiger says: I’ve never been to The Great Singapore Sale before. So looking forward to it! The GSS is now wor! When are you going???? The Giddy Tiger says: We are going SOON! Whoopeee!! !